Cook rice in water as directed on package. Meanwhile, in small bowl, mix onion, garlic, chili powder, cumin, cinnamon and salt; set aside. In another small bowl, mix chipotle chile, preserves, green chiles, raisins, cocoa and almonds; set aside. In 12-inch skillet, cook pork over medium-high heat 8 to 10 minutes, stirring occasionally, until no longer pink; drain. Stir onion mixture into pork; cook over medium heat 2 minutes, stirring occasionally. Stir in preserves mixture, broth and enchilada sauce; heat to boiling. Reduce heat to low. Simmer uncovered 30 minutes, stirring occasionally. Stir in beans and rice; cook 2 to 3 minutes or until hot and bubbly. Meanwhile, heat tortillas as directed on package. To assemble, spoon slightly less than 1/2 cup pork filling down center of each tortilla. Sprinkle about 1 tablespoon cheese over filling on each. Fold in ends of each tortilla; fold sides toward center, overlapping edges. To serve, place burritos, folded sides down, on plates. Garnish each serving with about 1 tablespoon sour cream and cilantro sprigs. Serve with tortilla chips. 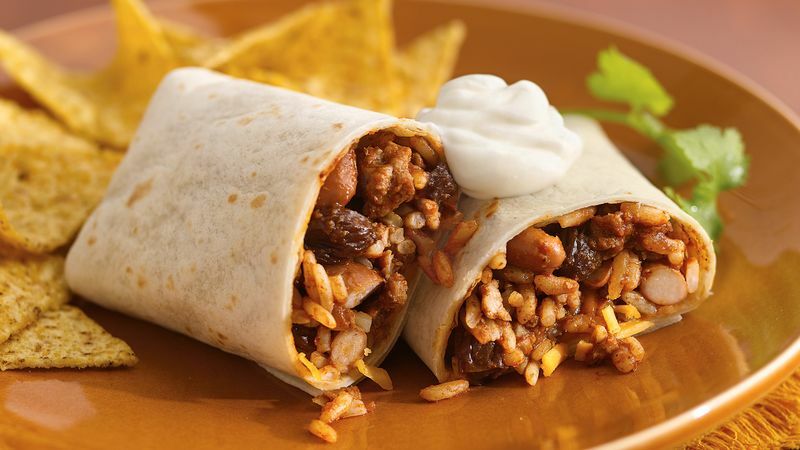 If you’ve never tried burritos with mole sauce before, you may be scratching your head at some of the ingredients in the list for this pork burritos recipe. Cinnamon? Apricot preserves? Baking cocoa? These aren’t mistakes, we promise. In fact, along with chiles and spices like cumin and chili powder, these are some of the most important ingredients to an amazing mole sauce. There are actually many variations of mole sauce out there, but most are often characterized by sweetness and spiciness, and sometimes even a bit of bitterness, which is while you’ll see spicy peppers, sweet fruits and chocolate in many recipes. The unique blend of flavors is often said to represent the blend of indigenous and European heritages of Mexico. Once you try these spicy mole pork burritos, you’ll be a big fan of burritos, guaranteed. Good thing we have even more recipes for you to try next, plus more Mexican favorites like tacos and enchiladas.